Crunchy Bite Sized Bacon Tots will be the hit of your next get together. 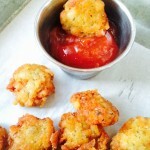 Whether served as an appetizer or a side dish you will LOVE these crunchy, bacon filled tots. 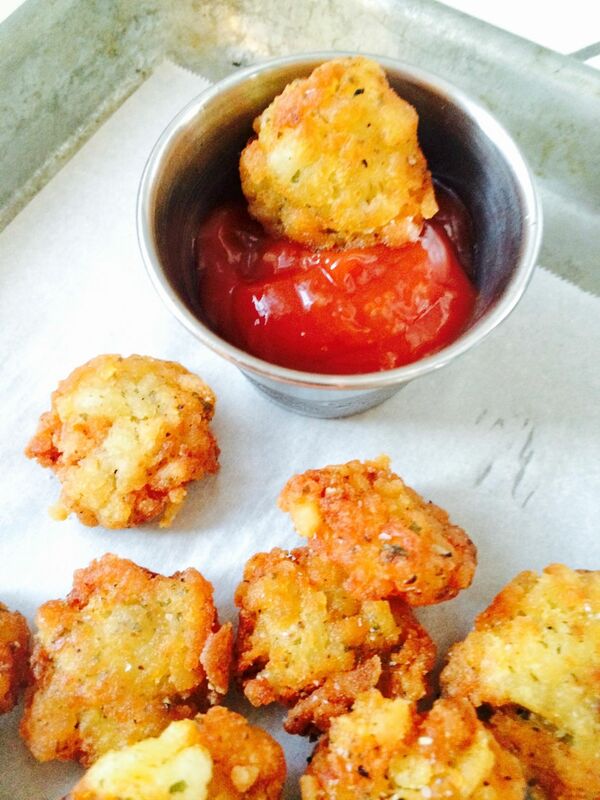 Better than your average tot because it has Bacon in it too! You heard that right? Crunchy Bite Sized Bacon Tots! Bacon in your tater tots! Al of those are great ways to have bacon but I wanted an appetizer to share with you so I tried adding bacon pieces to this recipe for Crunchy Bite Sized Bacon Tots! I have always loved tater tots so it seamed only natural to add bacon to them and see what happened. When you make these the trick is to crisp the bacon up before adding it to the tot so you have already drained away the bacon fat which would make the tot a little greasy if you don’t crisp it really well. It doesn’t take much bacon to flavor a whole batch. So it’s quite economical for a party. I tried two ways for shaping the tots. The traditional log shape and a coin shaped disc. At our house we preferred the coin shaped disc because we like things really crispy and crunchy. The smaller surface area gave more crunch! EASY/DIFFICULT: Easy to make, but they can be time consuming. They are very addicting so you have to make a lot of them. PREP AHEAD? Yes! 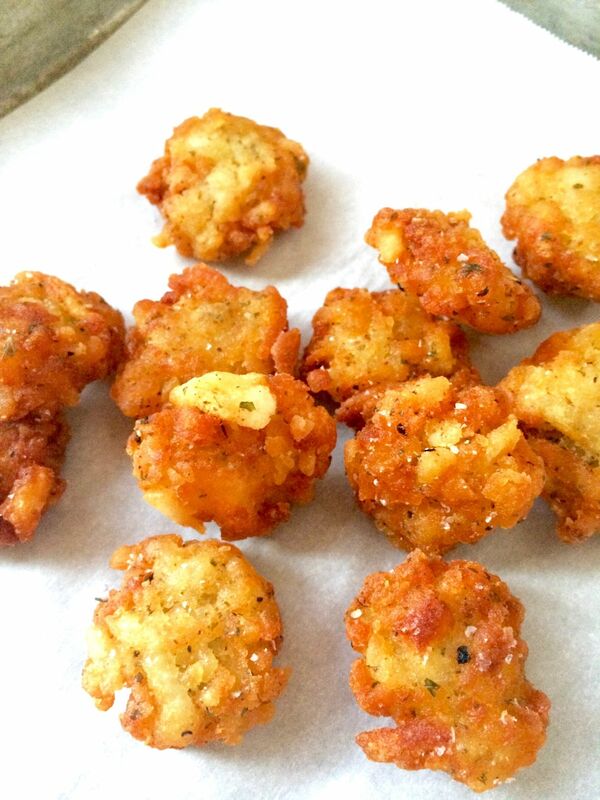 You can make these ahead of time and just fry them to order when you need them. You can assemble these up to 24 hours ahead keep covered in the refrigerator until you are ready to fry them. BONUS: These are freezable! I made a quadruple batch and froze half of them for a later time. That really is a bonus the next time you are ready to serve them! SERVING SUGGESTIONS: As an appetizer serve them with different dipping sauces. This Sriracha Dipping sauce, or this horseradish cream sauce or a traditional ketchup or BBQ sauce are some options for you! For something really different and colorful try this Herby Sauce! Place 3-4 paper towels on a microwavable plate, then lay 4 strips of bacon across the paper towel. Cover top of bacon with another paper towel. Microwave on high, start with 4 minutes. Each microwave is different, you want the bacon to be extra crispy, but not burnt. Once bacon finished, allow to cool then break or cut bacon into tiny pieces. While potatoes are still warm, peel the skins away. Using a cheese grater, grate peeled potatoes into a mixing bowl. In mixing bowl over the top of the potatoes sprinkle crumbled bacon, 1 tbs of flour, salt and pepper. To test if it needs more flour take a tablespoon of mixture and squeeze it in your hand into the desired shape (see blog for picture of coin vs log shaped.) If it sticks together and doesn't fall apart you do not need to add any more flour. If they don't hold together sprinkle the other tbs of flour into the potatoes. Make remaining mixture of potatoes into desired shapes and place on a cookie sheet. Once all tots are made, let them sit for a minimum of 10 mins to set. ** SEE NOTES FOR FREEZING OR PREPPING AHEAD OF TIME! In a pan, add oil to be about 1 " deep. Turn oil on to Med High and get oil hot. Once you feel the oil is hot enough, add one tot to pan. If the oil starts immediately bubbling when tot is placed in the pan, add several tots to pan and cook until one side is a golden brown color (about 2-3 minutes). Be sure to leave enough space in between to not overcrowd the pan. Then flip the tater tot and brown the second side until it is golden brown as well. Once both sides are nice and crispy golden brown, remove from the pan with a slotted spoon and allow to drain on a stack of paper towels on a plate. Repeat frying steps until all tots are complete. Season to taste once all Bacon tots are complete. Serve immediately with any of these sauces: Ketchup, BBQ, Horseradish Cream, Herby Sauce, Sriracha Sauce! You can prepare these to this step and place in the refrigerator until ready to fry/serve. You can also freeze them at this point for a later use. If you are freezing them, flash freeze them on a flat plate for 30 minutes so they hold together. Then gently place in a sealed container for future use. I stored them for up to 3 weeks before serving them. I allowed the potatoes to thaw for 1 hour before beginning the frying process. You said bacon? Why yes, I’ll have a bowl of those. That look amazing, delicious. I could eat them all! This is the best mix of foods that I have seen in a long time. Since everyone loves tater tots and bacon, I can’t imagine that this wouldn’t be a food favorite at any family dinner gathering. Funny how we go through phases with food huh? I’ve been on a reall kick with seeds. Sesame, pumpkin, pepitos… can’t get enough of them! A lot of people in my family are bacon lovers. This sounds like a delicious recipe that would really make them happy. Tater tots are my kryptonite. Now you are adding bacon?! Hand me my fat pants, please! Omg you had me at bacon!!!!!! I will definitely be making these. So yummy! Oh man! I need these in my life, like right now! I am drooling over here! I do have potatoes in the fridge…maybe a little cooking session is in order! Love this food. Will try this recipe soon. Amazing! Wow! Are you kidding me? My son wouldn’t eat a tater tot to save his life, but I bet if I presented these to him, none of the rest of us would get one. lol These sound and look fantastic! 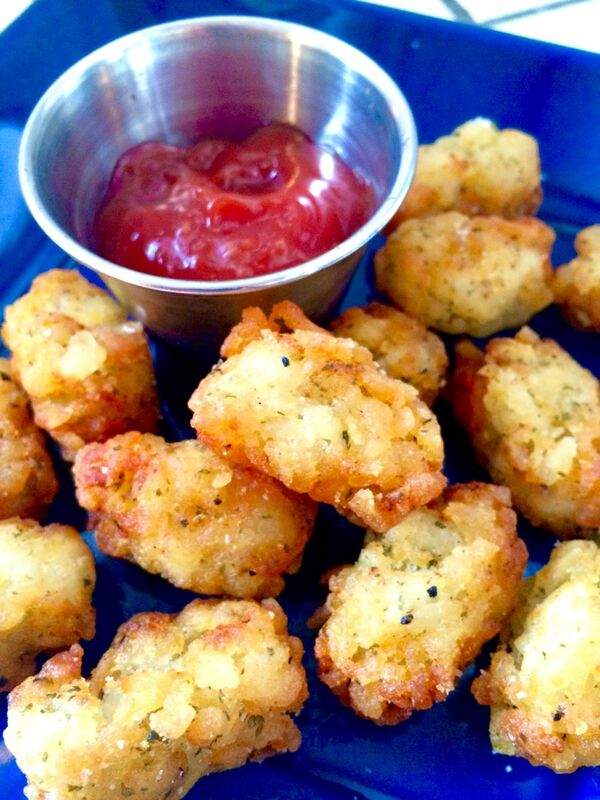 I am all for tots. They are one of my fav things if I go to Sonic. That and a slushy. Bacon tots?!?! I need this in my life. It sounds absolutely amazing. What a great combination! Bacon is one of those foods people love or hate. My daughter happens to be in the love group. She would love this. OMG, these look amazing! Two of my favorite foods! Oh wow, these look amazing. I’m going to have to try these ones for sure. My bestie would murder someone for a bacon tot. I have never seen someone so obsessed with bacon I think he would even put it in his cereal lol. This sounds amazing! i think my 3 year old will love this! I will try it with turkey bacon! We actually had tater tots for dinner tonight and if I had seen this before, I might have made these instead but now I might just do it the next time we’re doing tots. Wow. This looks so good I might have to get out of bed right now to make them! What an amazing recipe. When I lived in Chicago I would order tots all the time. It is such a big there. I tried to make them once myself, but the recipe was too complicated. Can’t wait to try this one out. You’ve made it sound easy to follow. I would probably serve these to just one person: ME! Honestly these look amazing and I know my husband would love them, too! Terri~ You and I would get along great…. those are my thoughts exactly when I make these, “why do I have to share?” LOL Thanks for stopping by! This looks so good. I could see making this for bbq or cookout this summer! Great post! This looks so yummy! I want to make them on a Friday night! Very unique recipe-thanks! but think how much you’ll be loved if you do?!?!? This is a whole new level of tator tots. I love it! 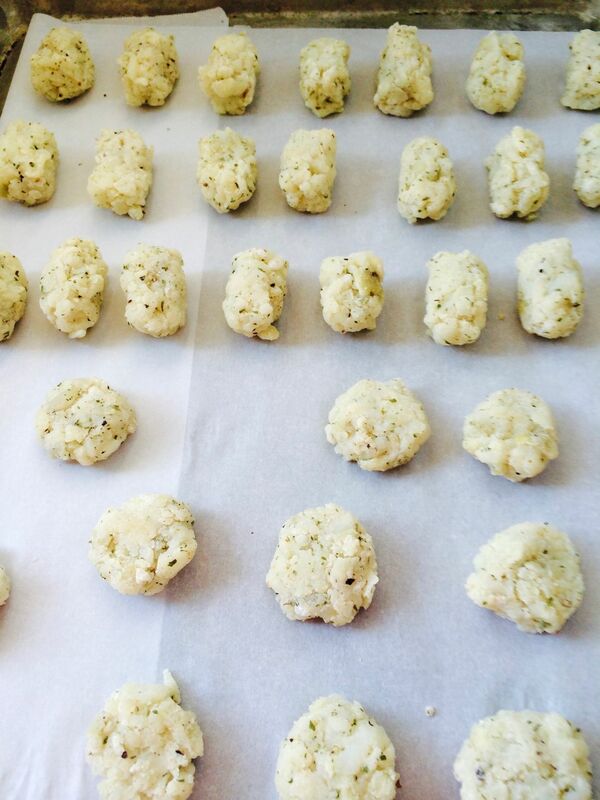 I love making my own tater tots! So much better than the store bought ones! You’re right, these do look addicting! But so worth it. So simple but so delicious. Just the type of recipes that I like. Will be giving these a try asap. Oh! Those look fantastic! I love adding the bacon idea! Super! Who doesn’t love bacon, after all! No-one in my world! W <3 bacon! These would disappear in my house in no time at all. I would have to make a double batch and keep the hubby away. These sound so evil but in a good way! I love that you’re using fresh potatoes for your tots here, and then with the bacon, just wow! you had me at crunchy bacon!